Posted In: XR6 (Perseus V) high power booster. The final ground tests for the X6-Nesaru rocket’s main parachute deployment system was performed earlier today, and I am happy to say, the test was successful. This clears the way for the maiden launch for X6 Nesaru rocket “Zephyr” this weekend. The latest weather forecasts for Saturday does not look good, as it calls for rain all day. There is a chance Sunday could work as the alternate launch day, but that ultimately depends on the exact arrival time of the three weather systems converging on Ohio. As of right now, it’s depending a lot on what hurricane Sandy does as it lands on the east coast. Final GO / NO GO call may occur as late as Saturday night or early Sunday Morning. 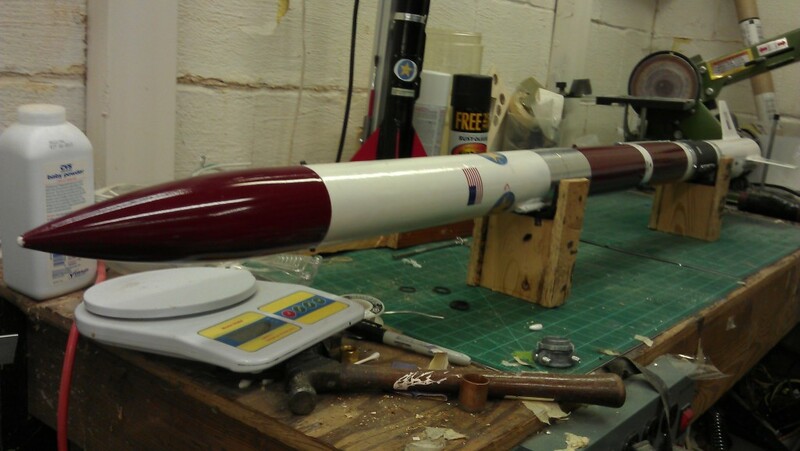 In the meantime, “Zephyr” is on the checkout bench bring prepped for its maiden launch. The countdown starts now for a possible Sunday launch of Zephyr. Here are some stats on the maiden launch, and my Level 1 certification attempt. Maximum expected altitude: 2100 Feet.